Only the deceased grandchildren will be included here to protect the privacy of the living. Maggie – 20 March 1892 – 20 March 1967.1 For the longest time I thought her first name was “Poor” because I almost always heard her called “Poor Maggie.” She was married three times. Maggie married William Den Adel (Jan 1886 – 14 March 1917)2 on 17 October 1913 in Lynden.3 Will died suddenly at age 31 from an asthma attack. Her next marriage was to Edward R. Hoekstra (20 April 1886 – 24 May 1934)4 on 28 October 1920 in Lynden.5 Ed was only 49 when he died in a fall from a water tower. Maggie’s last marriage was to Jake Haga (25 October 1901 – 19 February 1980)6 on 20 November 1942.7 She and Jake were married until her death. Maggie and Ed adopted a son they named Harold Clarence Hoekstra. Harold was killed in a hunting accident 14 October 1945.8 All are buried in Monumenta Cemetery in Lynden. Elizabeth – 20 March 1895 – 5 August 1976.9 Lizzie married Jacob Thomas Dyksterhuis (5 February 1888 – 16 January 1973)10 on 26 April 1916 in Lynden.11 They had four children together. Two daughters (Helen and Marie) died of tuberculosis while Lizzie was still alive. Sons John and Geert both passed away in 2002. Jacob and Lizzie are buried in Monumenta Cemetery. John – 26 November 1896 – April 1983.12 John married twice that I know of. His first marriage was to Rose Gardner and I have been told by family member that the marriage ended in divorce. His second marriage was to Mary Jane Byrnes. John was often at odds with his family. He perceived himself to be a high-end home builder, but while he apparently did build nice homes, he was not particularly enthusiastic about any type of work. He also as previously stated did not have the talent his father had for the art of the deal. John often returned home for extended periods of time, but was not known to be quick to lend a hand with the chores. 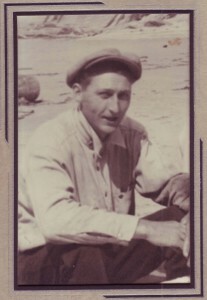 John moved to the upper peninsula of Michigan later in life. John had no known children. He is buried in Fairview Cemetery in Doyle, Schoolcraft County, Michigan. Janry – 6 December 1899 – 4 January 1969.13 Known formerly as Jane, she was called Jennie by her family and her death records and obituary are under Jennie. She married Berend “Ben” Nymeyer (27 May 1894 – 15 November 1973)14 on 15 October 1919 in Lynden.15 She and Ben had 6 children (Marie, Ralph, Johm, Jeanette, Peter, and Bernard) and are buried in Lakeside Cemetery in Lynden. Hugo – 19 October 1901 – 13 April 1969.16 Hookie was the child that took care of everyone else. I will have more on Hookie’s life in a later post. Hookie married Kathleen Elnora Klander (28 October 1918 – 26 January 1982)17 on 2 June 1939 in Port Orchard, Kitsap County, Washington.18 Hookie and Kathleen had no children and are buried in Ten Mile Cemetery outside of Lynden. Albert – 17 December 1902 – 19 June 1995.19 Albert married Jennie C. Ellofson (11 August 1907 – 17 December 2000)20 on 24 December 1924 in Bellingham.21 Albert operated several dairy farms and worked for the major dairy in Lynden. He was also well known as a local breeder. Their only child, Albert Leroy Burgraff died 15 December 1991.22 Albert, Jennie and Albert L. are buried in Lynden Cemetery. Arie Isaac – 22 October 1908 – 28 April 1939. As previously discussed in a post from 28 Jan 2010 Ike died of pulmonary tuberculosis. He married Dorothy Josephine Johnson (16 January 1908 – 15 September 1992) on 3 August 1927 and they had four children: Jack, Donald, Robert, and Donna, all of whom are deceased. Dorothy will be discussed when I get to the Johnson line. He is buried in Monumenta Cemetery. Bastjaan – 21 June 1909 – 1 April 1938.23 Bert was married to Gertrude Edith Telgenhoff (11 May 1906 – 26 January 1992)24 on 24 September 1937 in Vancouver, Clark County, Washington.25 Bert died from spinal tuberculosis just a couple weeks before the birth of his only child. Gertrude never remarried and remained close to the Burgraff family. Both are buried in Monumenta Cemetery, although not together. Bert is in the Burgraff plot with his brother Arie, and Gertrude is with her parents Walter Telgenhoff and Ida Vanderyacht. I won’t discuss Marion or Sadie at this time. 1. “Maggie Haga Rites At 2 p.m. Friday,” (Bellingham) The Bellingham Herald, 22 Mar 1967, p. 17. 2. “MANY ATTEND FUNERAL OF WILLIAM DEN ADEL,” (Lynden) Lynden Tribune, Thur., 18 Mar 1917, p. 1. 3. Washington State Archives, marriage license 1586 (17 Oct 1913), William Den Adel-Maggie Burgraff; digital image, Washington State Archives, Washington State Digital Archives (http://www.digitalarchives.wa.gov). 4.Whatcom County, Washington, death certificate no. 81 (24 May 1934), Edward R. Hoekstra; Washington State Vital Records, Olympia Washington. 5. Whatcom County, Washington, Marriage Licenses, 5088, Edward Hoekstra-Maggie Den Adel, 8 Oct 1920; Whatcom County Marriage Records, Bellingham. 6. Washington State Deparatment of Health, “Washington Death Index, 1940-1996,” database, Ancestry (http://www.ancestry.com: accessed 10 Feb 2010), Jake Haga, 19 Feb 1989, Bellingham, Cert #004653. 7. Whatcom County, Washington, Marriage Licenses, 11185, Jake Haga-Maggie Hoekstra, 20 Nov 1942; Whatcom County Marriage Records, Bellingham. 8. Washington State Deparatment of Health, “Washington Death Index, 1940-1996,” database, Ancestry (http://www.ancestry.com: accessed 10 Feb 2010), Harold C. Hoekstra, 14 Oct 1945, Cert #211. 9. Washington State Deparatment of Health, “Washington Death Index, 1940-1996,” database, Ancestry (http://www.ancestry.com: accessed 7 Jul 2009), Elizabeth Dyksterhuis, death 5 Aug 1975, Whatcom County, Cert. #020111; Washington State Archives, Olympia, Washington. 10. Washington State Deparatment of Health, “Washington Death Index, 1940-1996,” database, Ancestry (http://www.ancestry.com : accessed 7 Jul 2009), Jacob T. Dyksterhuis, death 16 Jan 1973, Whatcom County, Cert. # 002528; Washington State Archives, Olympia, Washington. 11. Washington State Archives, marriage license 2736 (26 April 1916), Jacob T. Dksterhuis-Elizabeth Burgraff; digital image, Washington State Archives, Washington State Digital Archives (http://www.digitalarchives.wa.gov). 12. Social Security Administation, “Social Security Death Index, Master File,” database, Ancesty (http://www.ancestry.com: accessed 7 Jul 2009), John Burgraff, 367-16-8131; Social Security Administration. 13. Washington State Deparatment of Health, “Washington Death Index, 1940-1996,” database, Ancestry (http://www.ancestry.com: accessed 10 Feb 2010), Jennie Nymeyer, death 4 Jan 1969, Cert #090744; Washington State Archives, Olympia, Washington. 14. Washington State Deparatment of Health, “Washington Death Index, 1940-1996,” database, Ancestry (http://www.ancestry.com: accessed 7 Jul 2009), Ben Nymeyer, death 15 Nov 1973, Cert. #027758; Washington State Archives, Olympia, Washington. 15. Washington State Archives, marriage license 4431 (15 October 1919), Ben Nymeyer-Jennie Burgraff; digital image, Washington State Archives, Washington State Digital Archives (http://www.digitalarchives.wa.gov). 16. Washington State Deparatment of Health, “Washington Death Index, 1940-1996,” database, Ancestry (http://www.ancestry.com: accessed 7 Jul 2009), Hugo Burgraff, death 13 Apr 1969, Lynden, Whatcom, Cert.#010495; Washington State Archives, Olympia, Washington. 17. Social Security Administation, “Social Security Death Index, Master File,” database, Ancesty (http://www.ancestry.com: accessed 7 Jul 2009), Kathleen Burgraff, 534-28-2319, born 28 Oct 1918, died Jan 1982; Social Security Administration. 18. Washington State Archives, marriage certificate 11452 (2 Jun 1939), Hugo Burgraff-Kathleen Elnora Klander; digital image, Washington State Archives, Washington State Digital Archives (http://www.digitalarchives.wa.gov). 19. Washington State Deparatment of Health, “Washington Death Index, 1940-1996,” database, Ancestry (http://www.ancestry.com: accessed 8 Jul 2009), Albert Burgraff, death 19 Jun 1995, 539-12-0556, Cert. #021177; Washington State Archives, Olympia, Washington. 20. Social Security Administation, “Social Security Death Index, Master File,” database, Ancesty (http://www.ancestry.com : accessed 8 Jul 2009), Jennie C. Burgraff, death 17 Dec 2000, birth 11 Aug 1907, 532-58-5340; Social Security Administration. 21. Whatcom County, Washington, Marriage Licenses, Albert Burgraff-Jennie Ellofson, 24 Dec 1924; Whatcom County Marriage Records, Bellingham. 22. Washington State Deparatment of Health, “Washington Death Index, 1940-1996,” database, Ancestry (http://www.ancestry.com: accessed 10 Feb 2010), Albert L. Burgraff, 29 Dec 1991, Cert #035289. 23. Whatcom County, Washington, death certificate no. Record No. 1, Registered No. 107 (1 Apr 1938), Bert Burgraff; Washington State Vital Records, Olympia, Washington. 24. Washington State Deparatment of Health, “Washington Death Index, 1940-1996,” database, Ancestry (http://www.ancestry.com: accessed 20 Feb 2010), Gertrude E. Burgraff, 26 Jan 1992, Cert #001505. 25. Washington State Archives, marriage certificate 74101 (25 Sep 1937), Bert Burgraff-Gertrude E. Telgenhoff; digital image, Washington State Archives, Washington State Digital Archives (http://www.digitalarchives.wa.gov: accessed 20 Feb 2010). I am happy to provide a quick note about George Chester Bryant. He was the second husband of Dorothy Josephine Johnson Burgraff and without Chet things may not have turned out so well for the Burgraff children. Chet married Dorothy in 1941 and took on her four children during a time when money was pretty hard to come by. He raised those four as his own and then became grandfather and great-grandfather to successive generations of Burgraff children. Chet’s mother Margaret Utterback died shortly after his birth and Chet and his two sisters, Clacey and Lula were split up between the Bryant, Utterback and Brown families. While Chet remained in Oklahoma with either his uncles Wiley or William Bryant, Clacey and Lula were sent back to Kentucky and raised with Margaret’s family, although not in the same home. Chet’s research will be filed with the Johnson/Wilson/Tuttle/Bryant category tag.